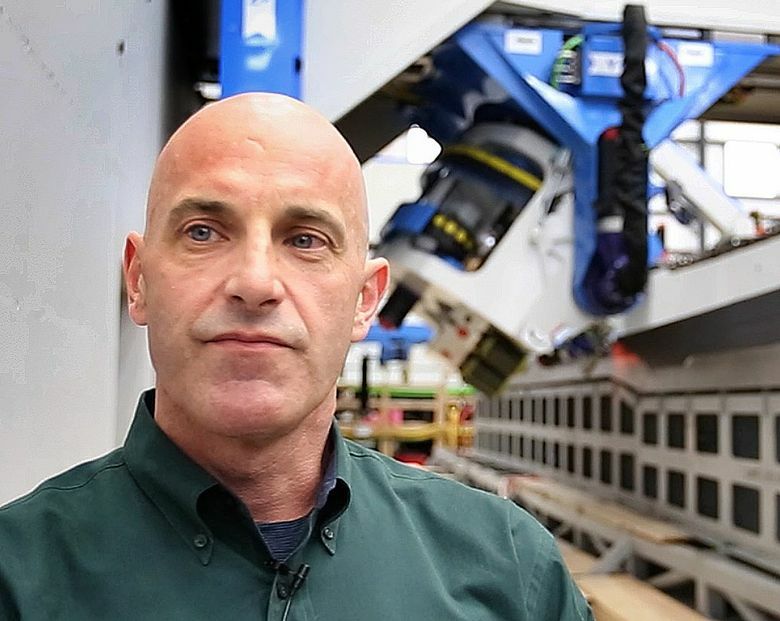 To fabricate the composite parts of the giant wings of Boeing’s 777X, Mukilteo-based engineering firm Electroimpact has designed and built a new generation of robotic machines that haven’t been previously shown to outsiders. Robotic heads zipped along at great speed, whirling and repositioning at the end of each run, as their business end — which glowed like a line of fire — laid down thin strips of carbon fiber infused with epoxy resin. 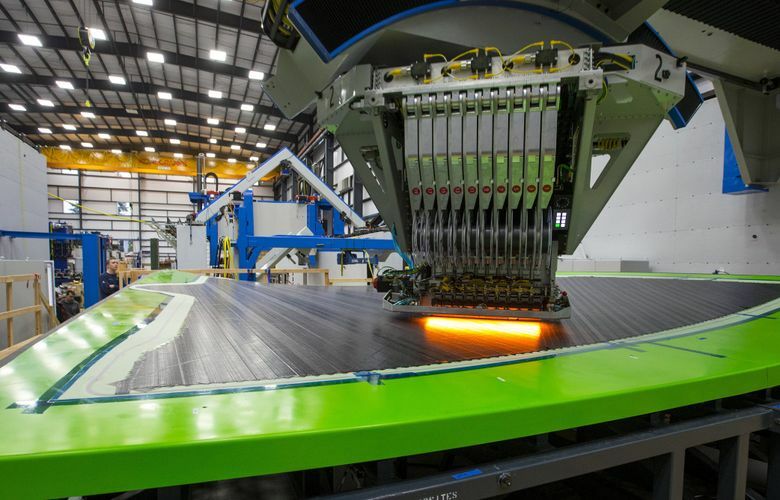 The manufacturing machines giving this dazzling performance, designed and built by Mukilteo-based Electroimpact, will be used to fabricate the giant composite wings of Boeing’s next jet, the 777X. What it makes: State-of-the-art automation used by aerospace manufacturers to fabricate parts and assemble aircraft. Think of these machines as 30-foot-tall, 3-D printers, each costing tens of millions of dollars. While similar machines have been making composite parts for several years, Electroimpact project manager Todd Rudberg said his team’s machines take the technology’s speed, scale and precision to whole new levels. Precisely placing layer upon layer of carbon-fiber strips infused with epoxy resin, one of these so-called Automated Fiber Placement (AFP) machines builds up the 777X’s composite wing skin, producing a single piece 110 feet long and 20 feet across at the widest end near the fuselage. The second AFP machine does something more complex: It lays the carbon-fiber strips down on a surface that has two 90-degree angles to make a U-shaped structural beam for the wing, called a spar, again in a single piece. The precise contouring made possible by this composite manufacturing technology is what allows Boeing’s engineers to design newly slender and aerodynamically perfect wings. Electroimpact has already delivered the first AFP spar machine to Boeing’s new composite-wing center, which is nearing completion just across Paine Field. Thanks to Electroimpact’s location, the machine was loaded onto an oversize trailer and had to travel only a couple hundred yards of public road to reach the airfield. 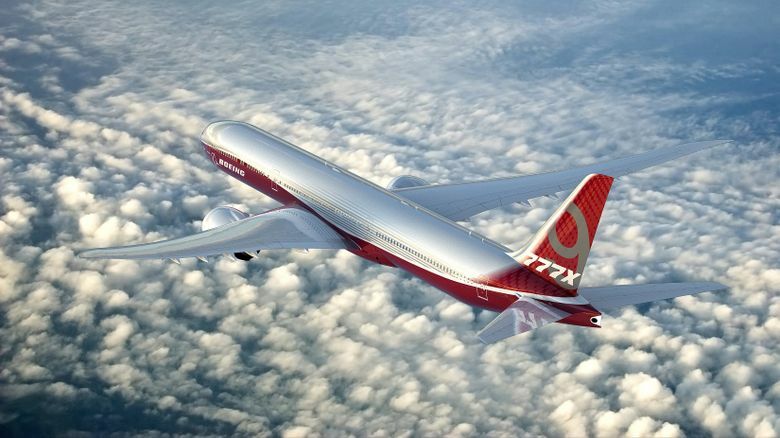 Next summer, Boeing will start using the machines to manufacture wing skins and spars for 777X development and production. Making the skins and spars of such a giant wing in single full-length pieces is new. It should reduce the cost of manufacturing and save some weight because there are no joins. Using a wholly different method, the composite wing spar of the 787 is made in three sections by Mitsubishi Heavy Industries in Japan. In the U.K., Airbus supplier GKN uses AFP machines to fabricate the spars of the A350 wing, also in three sections. To protect Boeing’s competitive advantage with the new equipment, Electroimpact has assigned the proprietary intellectual property on the 777X machine heads to the jet maker. So though Electroimpact will certainly sell future AFP machines to rival plane makers, the key technology in these machines will be exclusive to Boeing. For initial, low-rate production, Boeing will need just two of each machine. But at peak production sometime in the 2020s, there could be half a dozen or more of each lined up inside the vast 777X wing facility. 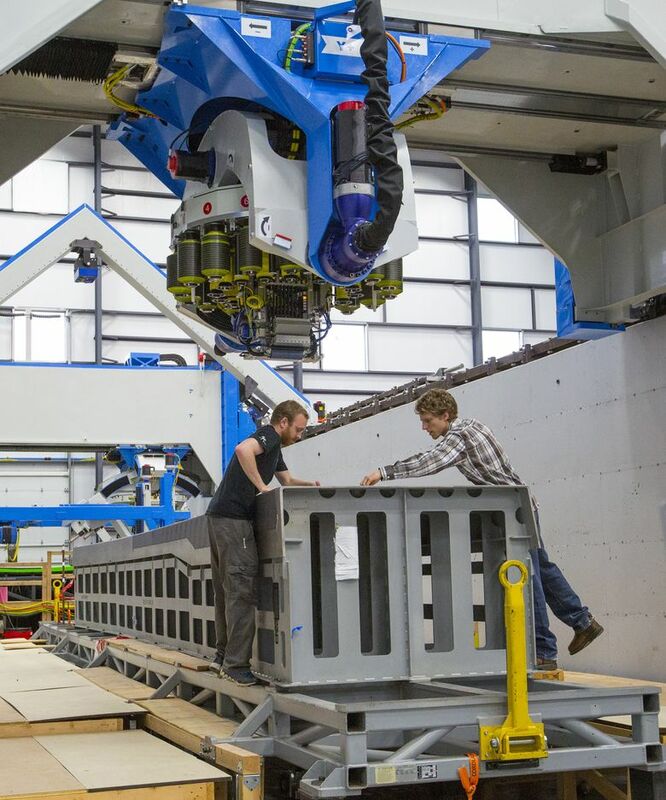 Suspended delicately from a 42-foot-wide gantry, the 1.7-ton robotic head of the wing-skin AFP machine zips back and forth across a contoured horizontal surface, laying down the strips of carbon-fiber tape, each pass building another layer of material. Where the machine head lightly touches the surface it’s building up, a glowing heating element at the tip makes the substrate tacky so the next layer will stick more easily. As this hypnotic dance unfolds, the machine head dispenses the tape simultaneously from 20 large spools that resemble movie reels, covering a 30-inch-wide swath with each pass. The only sound is the light ticking of pneumatic actuators as the head shifts to lay the tape down at another angle or ends a pass and cuts the tape off at the correct length. The wing-spar AFP machine’s half-ton robotic head lays down thinner, half-inch strips of carbon-fiber tape from 16 large bobbins that allow the tape to shift as needed when the head zips over the edge of the spar with nary a pause. Each wing has front and rear spars, long curved structural beams along the leading and trailing edges. The machine can lay down a full lengthwise layer along the spar in approximately 10 minutes. Dispensing another layer with strips traversing the spar at an angle can be done in about 25 minutes. Once the AFP machines are up and running to produce wing parts, Boeing will operate them continuously for as much of the day or night as needed to support its production rate. On current AFP machines, minutely inspecting the parts for defects while the machine is stopped takes as much time as laying down the material. Brock Jahner, 29, lead engineer on the wing-skin AFP head, said one piece of the “neat new technology we’ve been able to build in designing all this new hardware” is an integrated self-inspection system. The machine takes measurements as the carbon-fiber strips are laid down and will alert the operators if a strip is missing or misaligned in any section. Then lasers overhead will shine a green outline around the patch that requires attention, so the operators can quickly determine if they need to take off those plies and redo it. Also to enhance productivity, Electroimpact has built a head-changing station beside the machine, so that when the spools of carbon-fiber tape have unwound completely, a fresh head is waiting and can be switched out for the old one in less than two minutes. Electroimpact is already a world leader in drilling, fastening and automated assembly equipment. It has supplied major tooling systems that assemble the wings of all Airbus aircraft. Bombardier uses Electroimpact-designed final-assembly lines for its business jets and a wing-assembly line for its CSeries jet. Electroimpact also provides tooling to Embraer for the wings of its KC-390, a military transport. In Renton, it provided the latest technology to automate the drilling and fastening of the 737 wing panels, a key part of that plant’s acceleration of production. AFP machines are its newest endeavor, and the 777X work vaults the company into the front rank of that technology. Between 80 and 100 electrical, mechanical and software engineers — strikingly young, as a rule — worked on the 777X wing project at peak. With the design now complete and the project in the testing phase, about half that number are still working on it. Of a small group of engineers clustered around their computers next to the spar machine on a recent day, four were between ages 23 and 25. The fifth, Chris Kingsley, lead process engineer on the spar AFP machine, is a relatively grizzled veteran of 28. At Electroimpact just a couple years, Kingsley previously served in the Peace Corps in Panama as a water and sanitation engineer. As that background suggests, Electroimpact attracts engineers who are not only smart but also open to new challenges. Justin Nielson, 33, the lead engineer in designing the AFP wing-skin machine structure, has been at Electroimpact for eight years and before that spent a couple of years as an airframe stress analyst at Boeing. The job of an engineer differs between the two workplaces, he said. At Boeing, an engineer works on one small piece of a massive airplane project. At Electroimpact, an engineer must integrate his piece into the whole and get out on the shop floor with the rest of the team to build the entire piece of equipment. Together, they then must test it, debug it, get it working smoothly and install it wherever it’s going. 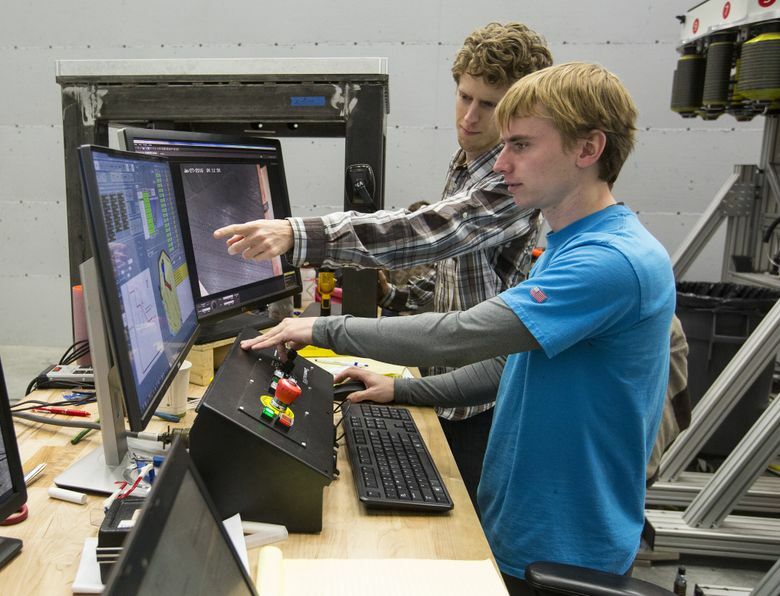 Enthused by the fun and the challenge of the technology they design, this young team’s work may well help maintain the region’s pre-eminence as an airplane-manufacturing center.